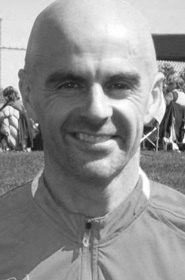 Malcolm Smillie has been an elite middle distance runner as a Masters Track athlete since turning Masters in 2000. Last July, he continued his dominance of these events at the Provincial Masters Track and Field Championships in Nanaimo. Not only did he win the 800 and 1500 meters to remain the Provincial Masters Champion, but also he has won these two events in the 40-44 and 45-49 age groups for the past ten years. This has resulted in ten consecutive double titles. At 49, Malcolm Smillie is in the final year of the 45-49 age class. His previous achievements are equally impressive. In 2003, he was the Canadian Masters Champion for his age group in the 800 and 1500 meters. The next year, he repeated as Champion in the 1500 meters and Runner-up in the 800 meters. The highlight of his career was at the World Masters Games in Edmonton in 2005, where he won the 1500 meters and came second in the 800 meters in his age group. Growing up in Scotland, Malcolm was an accomplished soccer player when he decided to run in competitive track at 19 and entered the 800 meters at the Highland Games. He did not perform well. Rather than returning to soccer, he chose to challenge himself and became one of Scotland’s top runners by his early 20’s. Unfortunately, when he was at his peak he had to compete against premier middle distance runners in Great Britain like Sebastian Coe, Steve Kram and Steve Ovett. However, he was good enough to earn a scholarship to the University of South Carolina, where he competed in the school’s track and cross-country programs. Today, Malcolm Smillie trains nine to 10 times a week while managing family responsibilities. He realizes that he is battling an inevitable decline that comes with age, but he still believes that a 100 per cent effort is still a 100 per cent effort.